Emerging Products manufactures, markets and distributes a number of products. The reading rest like no other! 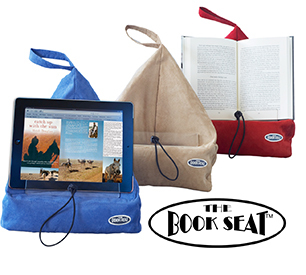 Similar to a small beanbag, The Book Seat allows for hands-free reading, reducing associated discomfort that can occur whilst holding a book or tablet device. The Book Seat gives you the freedom to sip your cuppa, take notes, or simply snuggle up on your side in bed with your hands warm under the covers. The first of it's kind, this original patented invention is sold worldwide with Emerging Products Pty Ltd being the exclusive manufacturer. Click here to go to The Book Seat website. Beautifully designed notebooks for your creative notes, journal or sketches. The Note Book is comprised of recycled paper pages with a pleasingly soft feel cover. 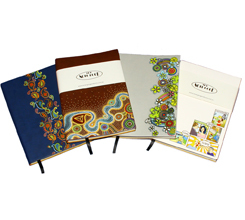 These delightful Note Books are available in four stylish designs. Paisley, Dot Art, Funkadelic & Retro Comic. 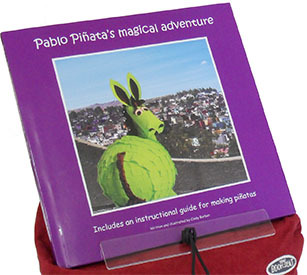 Bonus children's story, told in rhyme, of Pablo Piñata's Magical Adventure! Click here for more details about the book and how to purchase it online. 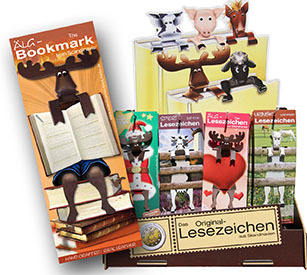 Handmade in Germany - this cute range of Scandinavian Bookmarks make a great gift. The original Alk (Elk or moose) is joined by a variety of animal styles including Vri the horse, sheep, cows, as well as favourites like the zebra, giraffe, hippo and elephant designs. With a range of themes including birthdays, 'Bon Voyage' and 'Thank You', thee is a Scandinavian Bookmark for any age and any occasion! Every single bookmark is cut out and folded, glued and painted by hand in 7 steps then finally embossed on the rear. They are made from impregnated leather and 100% made in Germany. Contact us for more details about Scandinavian Bookmarks.